We’d love your help. Let us know what’s wrong with this preview of Women in the Church by Stanley J. Grenz. To ask other readers questions about Women in the Church, please sign up. I'm a Complementarian who read this book to understand better the Egalitarian view. I believe it's an incredibly well written book and would recommend to anyone interested in the subject. I must admit I was skeptical at first wondering where this book would take its readers. By the time I was into the first couple of chapters I was hooked, wanting to see the next layer as the author peeled back the established views as one may peel an onion. The book has presented many valid points and dispelled some archaic thinking. It is a very good read and should open minds and dialogue. Same arguments as every other book on the topic. Regardless, there is much conjecture on either side. However, I still tend to see more direct biblical evidence on the complementarian position. I’m not done studying and learning though. This book was exactly what I was looking for. A comprehensive survey of Scripture, history, and other topics as they relate to the question of women's roles in ministry, from a perspective differing from that in which I was raised. The authors take a very high view of Scripture, present arguments with humility, pointing out those which are weak or based on an ambiguous point. I understand that this book was published long enough ago to be based, in part, on some out-of-date biblical scholarship, This book was exactly what I was looking for. 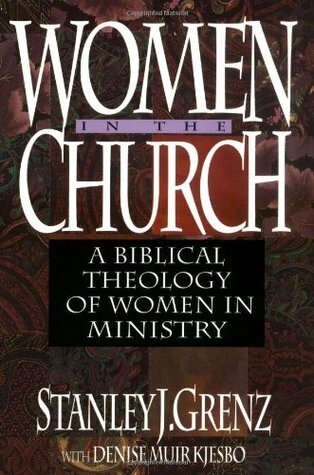 A comprehensive survey of Scripture, history, and other topics as they relate to the question of women's roles in ministry, from a perspective differing from that in which I was raised. A solid introduction to the issues regarding women in the offices of the Church. It was written some years ago now, and the hermeneutical and exegetical arguments have advanced since then, but it remains a quality introduction to the subject, and demonstrates that the hierarchical-complimentarian claims are at a distinct disadvantage, theologically speaking. A helpful, well-researched book that opens up the ancient world to modern readers in an accessible way. Laypeople, pastors, and seminarians alike will find many of their assumptions about the role of women in the church challenged even as the enduring authority of Scripture is upheld. Thoughtful Christians on both sides of the issue would do well to read this book. A comprehensive look with adequate space to the other side given, Biblically argued from both the didactic and descriptive passages of the Bible, with a challenge to the complementarian that views leadership in the Church primarily a position of power as opposed to service. An excellent introduction, but pales in comparison to Philip Payne's work. This is a great book into understanding what the Bible says about women and their roles in the Church!!! The writing is a little dry and academic, however the content of the book is great. The author covers almost every angle. Lots of helpful information. Great book. A great resource! Stanley James Grenz was born in Alpena, Michigan on January 7, 1950. He was the youngest of three children born to Richard and Clara Grenz, a brother to Lyle and Jan. His dad was a Baptist pastor for 30 years before he passed away in 1971. Growing up as a “pastor’s kid” meant that he moved several times in his life, from Michigan, to South Dakota, North Dakota, Montana and Colorado. After high scho Stanley James Grenz was born in Alpena, Michigan on January 7, 1950. He was the youngest of three children born to Richard and Clara Grenz, a brother to Lyle and Jan. His dad was a Baptist pastor for 30 years before he passed away in 1971. Growing up as a “pastor’s kid” meant that he moved several times in his life, from Michigan, to South Dakota, North Dakota, Montana and Colorado. After high school Stan began his undergraduate studies in 1968 with the idea that he would become a nuclear physicist. But God had other plans for him, and in 1971, while driving home to Colorado after a visit with his parents in Oklahoma, he received a definite call into full time Christian ministry. In 1970-1971 Stan traveled in an evangelistic youth team where he met Edna Sturhahn (from Vancouver, BC), who then became his wife in December, 1971. Both Stan and Edna completed their undergraduate degrees at the University of Colorado and Stan went on to receive his M. Div from Denver Seminary in 1976, the same year in which he was ordained into the gospel ministry. During the years of study in Colorado he served as a youth pastor and an assistant pastor. From Denver, Stan and Edna moved to Munich, Germany where Stan completed his Doctor of Theology under the mentorship of Wolfhart Pannenberg. Their son, Joel was born in Munich in 1978. During a two-year pastorate (1979-1981) in Winnipeg, MB, where daughter Corina was born, Stan also taught courses at the University of Winnipeg and at Winnipeg Theological Seminary (now Providence Seminary). His full time teaching career began at the North American Baptist Seminary in Sioux Falls, SD (1981-1990). Those years were followed by a twelve-year (1990-2002) position as Pioneer McDonald Professor of Baptist Heritage, Theology and Ethics at Carey Theological College and at Regent College in Vancouver, BC. From 1996 to 1999 he carried an additional appointment as Professor of Theology and Ethics (Affiliate) at Northern Baptist Theological Seminary, Lombard IL. After a one-year sojourn as Distinguished Professor of Theology at Baylor University and Truett Seminary in Waco, TX (2002-2003), he returned to Carey in August 2003. In fall 2004, he assumed an additional appointment as Professor of Theological Studies at Mars Hill Graduate School, Seattle WA. Stan has authored or co-authored twenty-five books, served as editor or co-editor for two Festschriften, contributed articles to more than two dozen other volumes, and has seen to print more than a hundred essays and an additional eighty book reviews. He had plans to write many more books. Two more of his books will appear in print within the next year. In addition to writing and lecturing all around the world, Stan loved preaching. He admitted to “breaking into preaching” in some of his lectures. He served as interim pastor of several congregations and as guest preacher in many churches. He loved the Church, both locally and worldwide. Stan wholeheartedly supported and encouraged his wife Edna in her pastoral ministry, her studies and in the enlargement of her ministry gifts. At First Baptist Church, he played the guitar and trumpet in the worship team and sang in the choir. He was proud of his children and their spouses, Joel and Jennifer and Corina and Chris, and delighted in his new granddaughter, Anika. Stan was a friend and mentor to many, always encouraging people to strive to new heights.